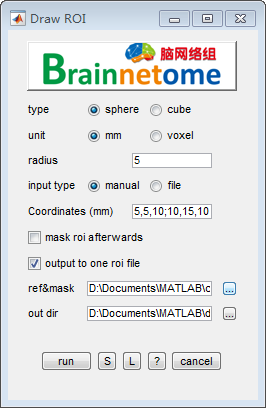 Draw ROIs is implemented as automatically drawing spheres or cubes with ROI coordinates and a header reference 3D image. The ROI coordinages and labels are sorted in a *.csv table for output indexing purpose, while the header reference image is used to define the output image properties such as bounding box, originator, orientation, inclusive mask, and voxel size. ref&mask: reference and mask file. for extracting information of origin, voxel size, bounding box, etc..